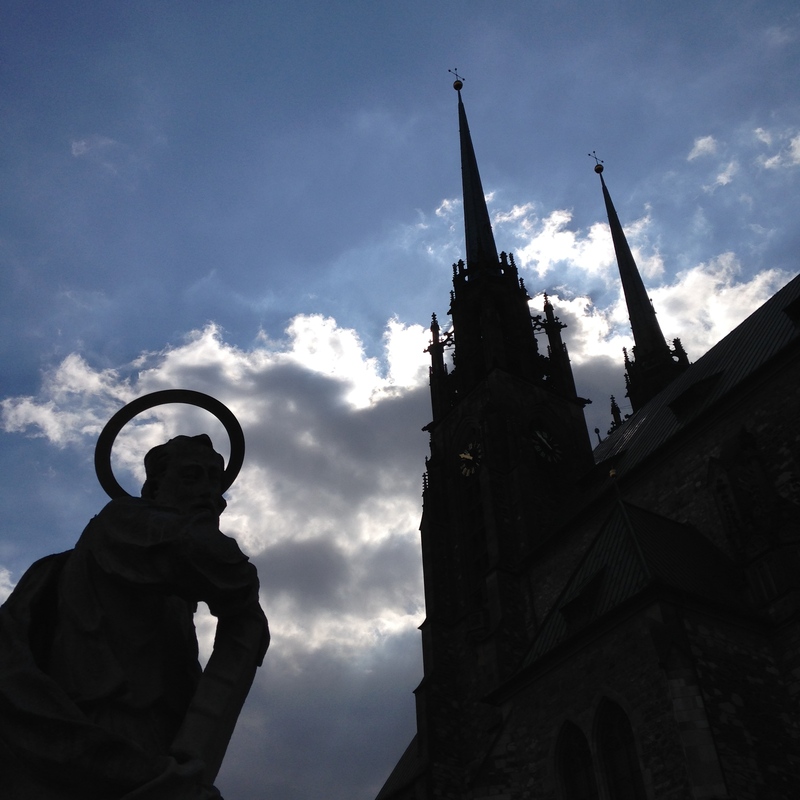 Prague is the bomb. It’s seriously such a gorgeous and photogenic city it blew me away. 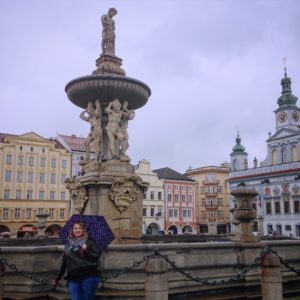 Back in April my mom and I spent 4 nights wandering the cobblestone streets and taking in the sights of Prague. Instead of going into great detail about what we did I’m going to tell you about the highlights only, and leave you with pictures that I hope will entice you to visit. 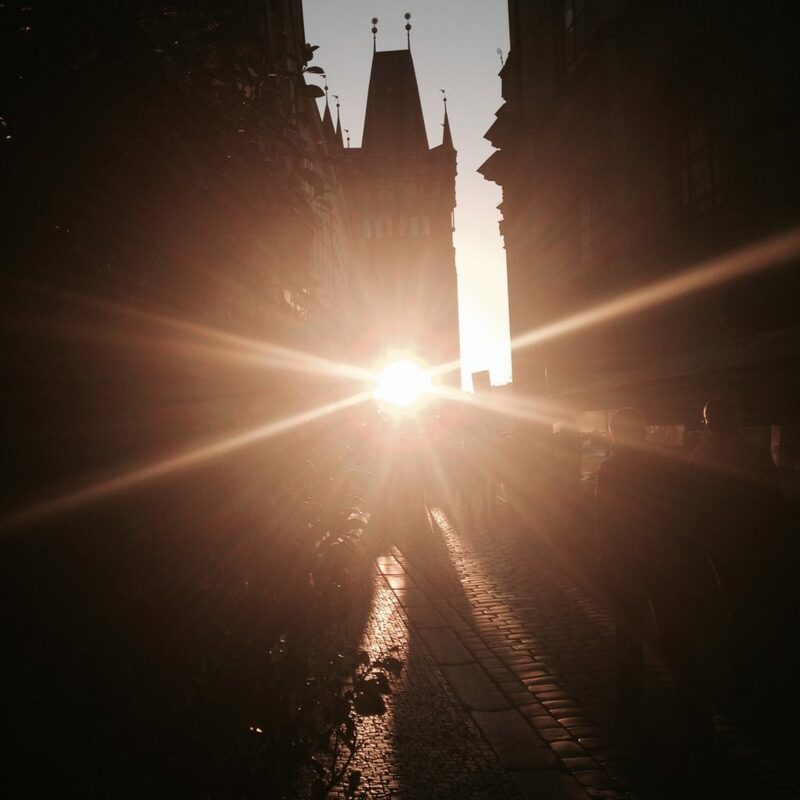 We wandered the Old Town Square which is stunning at sunset as is Charles Bridge which is always packed with tourists. 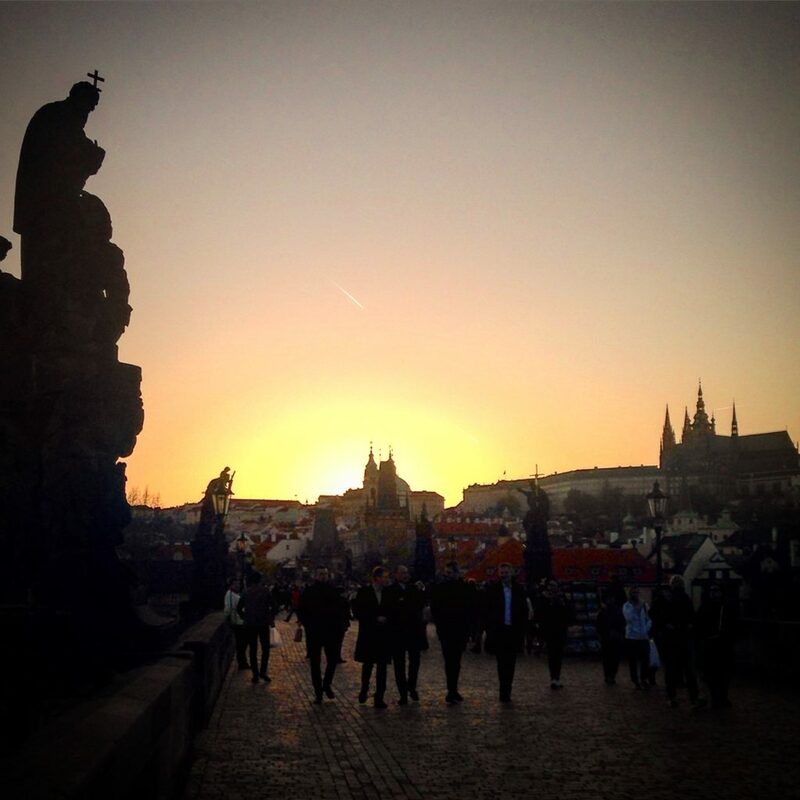 Charles Bridge was completed in the early 15th century and crosses the Vltava River which splits Prague in two. 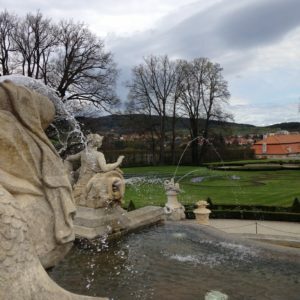 It is lined with statues which makes for great photos especially with the castle on the hilltop in the background. We spent the better part of a day visiting the Castle complex. The castle dates from the 9th century and the complex is a mix mash of churches, palaces, gardens and museums. The highlights for me where St Vitus Cathedral which had abstract stained glass windows that reminded me of Gaudi’s work at the La Sagrada Familia in Barcelona. 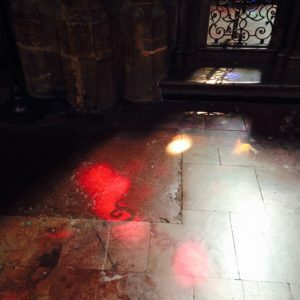 I found the light reflections thru the windows to the floor to be completely mesmerizing, but absolutely frustrating to try and capture their beauty on camera. 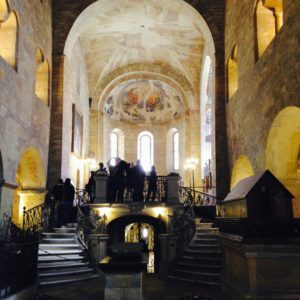 The Basilica of St George is the oldest surviving church in Prague and has partially preserved frescoes that are worth a look. The other impressive part of the castle complex was Golden Lane which is a series of small cottages that were recreated to feel like they would’ve when they were inhabited. Some of the houses date back to the 16th century. 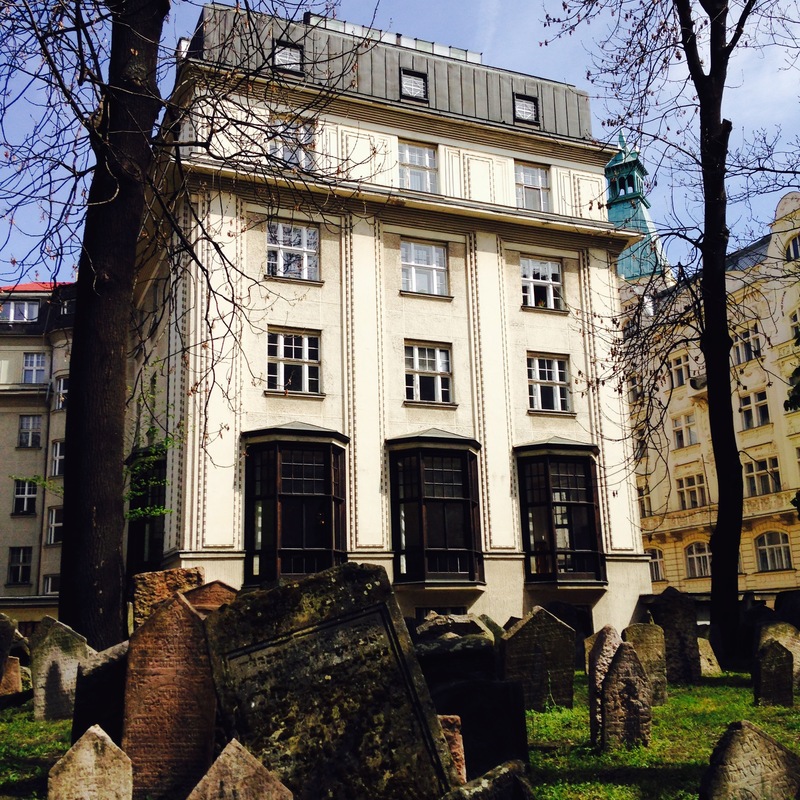 Prague also has a Jewish quarter known as Josefov where the Old Jewish Cemetery and numerous synagogues are located. 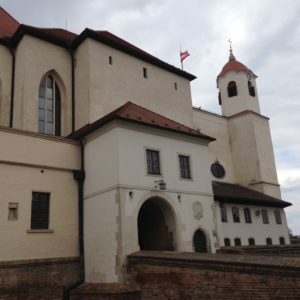 The Czech Republic has a lot of Jewish history which I will touch on in a later post when I discuss visiting the Terezin concentration camp just outside of Prague. Instead I’ll leave you with a some photos from our afternoon exploring. Most of the synagogues had beautiful stained glass windows and again I was awestruck by the way the light reflected thru them casting light throughout the rooms. Many, many photos were taken trying to capture this, and let me tell you it’s hard to get them to look as artistic as they did with the naked eye. 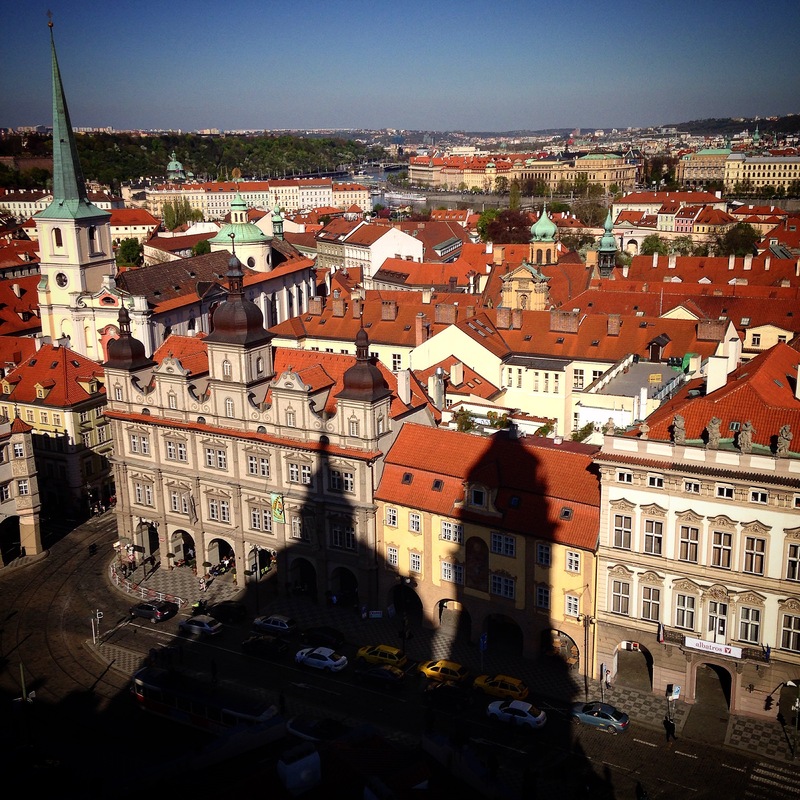 So that’s Prague. I’m sure you agree that it’s stunning, and it’s pretty easy to see why people rave about this city. 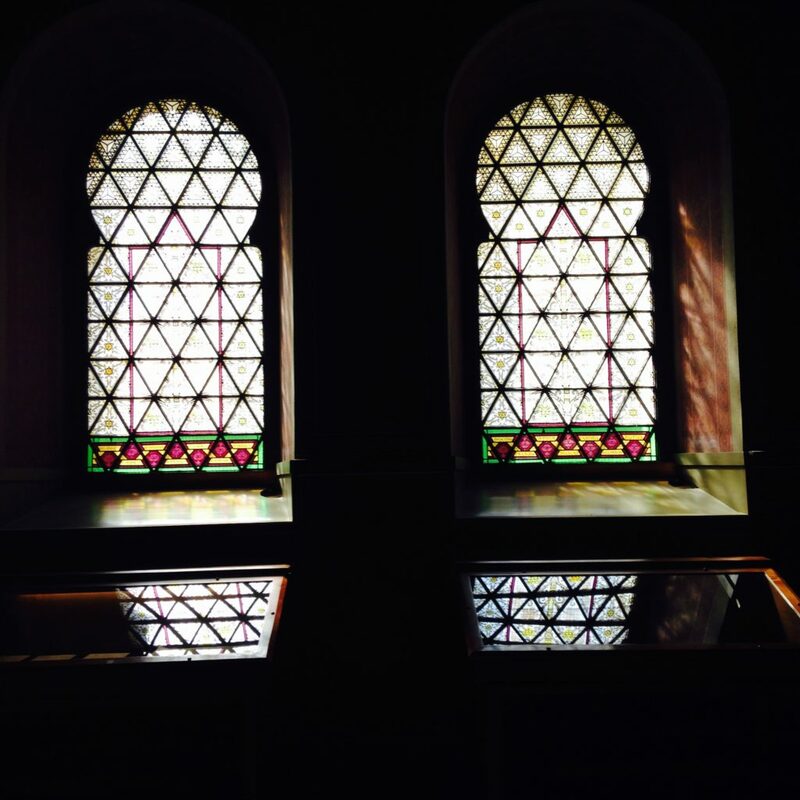 4 nights was the perfect amount of time to see everything we wanted to and to make a day trip to Terezin to hear about the Czech Republic’s Holocaust history. I’ve blogged before about how sometimes while traveling you meet someone who touches your heart. Or you give a little piece of your heart to them for safe keeping because you know that somewhere, somehow in the future your paths will cross. 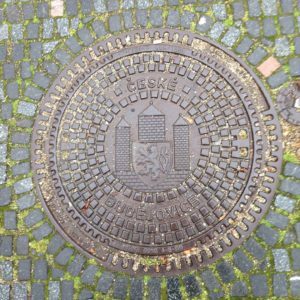 It was one of these connections that led my mom and I to city of Brno in the Czech Republic. This connection had formed years earlier in 2010 when I took my first solo trip from Saudi Arabia to Portugal. I was that nervous type of excited when I checked into a hostel in Lisbon. Unsure of how easily I would meet people, and if there would be anyone my age or coolness level staying there. Looking back I laugh at how nervous I was. Because, the me then had no idea what an awesome trip this would become. How I needn’t have worried. How easily I would make a tribe of new friends. One important member of my nomadic traveler tribe was a lawyer from Czech named Mira. He and I bonded over our inappropriate sense of humor and our love of hot Portuguese men. We also creatively changed the name of the local beer Superbock to Super…… I’m sure you can guess this without me actually typing it out. We were basically creative geniuses. Anyways, this and a couple of wild nights out in Lisbon bonded us. We spent the next several years as pen pals, sending each other letters and postcards from our travels around the world, as I moved from Saudi Arabia, back the US and later up to Canada. I’m affectionately known as his little Octopussie- in reference to some fresh seafood we saw in a window. You can see why we got along so well. When my mom and I started planning our European trip I knew that if we were going anywhere in Eastern Europe I had to link up with Mira! 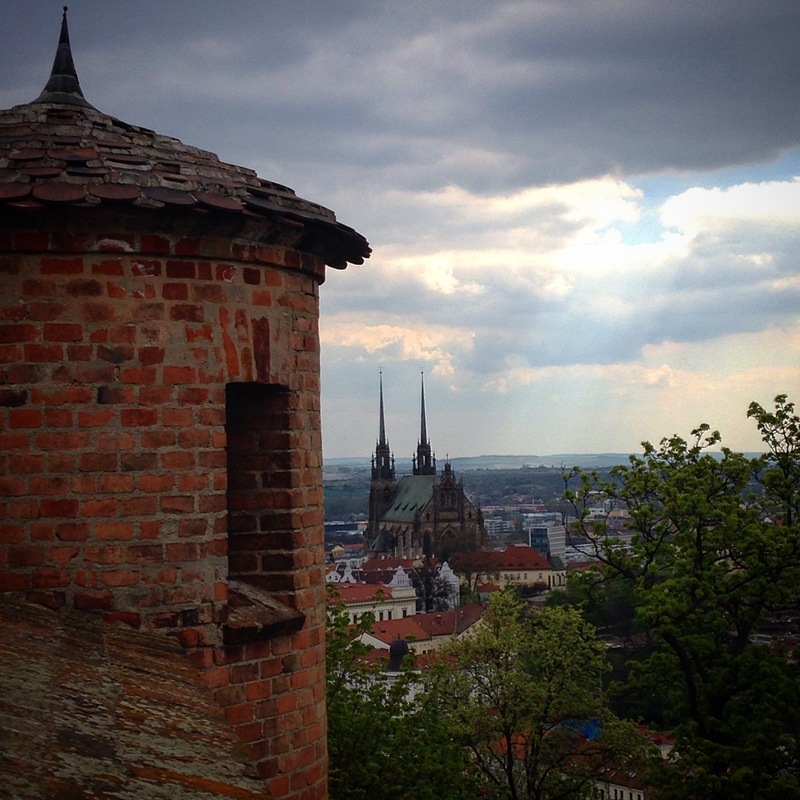 This is how Brno became a firm part of our itinerary. In fact, I told my mother is was non-negotiable. So we penciled in 2 nights in a fancy 5 star hotel in Bno. 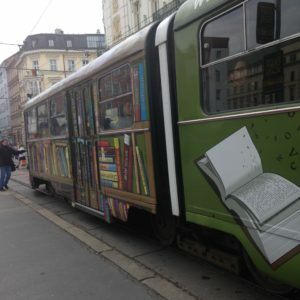 The easiest way to get around in Czech Republic is by bus. The train lines are limited and often no faster than taking the bus. We booked with Student Agency Bus and rode them several times. The buses are clean, comfortable, and they have wifi. Sometimes, but not always they speak English. We took the bus to Brno from Ceske Budejovice which took about 3 and a half hours. Mira met us at the bus station hardly looking any different in the nearly 6 years that had passed since we met. He led us back to our hotel pointing out the sights along the way and then later that evening we met up with him and his partner for dinner at a local Czech beerhouse. Czech beerhouses are a super fun experience. Often they only serve draft beer, so you can order light, dark, or mixed. I would recommend mixed. Meals tend to be meat heavy often pork or beef with dumplings or potatoes. To be honest I enjoyed the food we ate all throughout Czech. I can’t really recall not enjoying a meal, but to be fair as long as someone else is cooking instead of me I’m a pretty agreeable eater. One of the most favourite things we tried was an appetizer that loosely translates to “drowned bodies” which is sausages and cabbage soaked in vinegar and spices in a jar for a couple days. The proper Czech name of the dish is utopenci, and trust me- it pairs perfectly with beer. 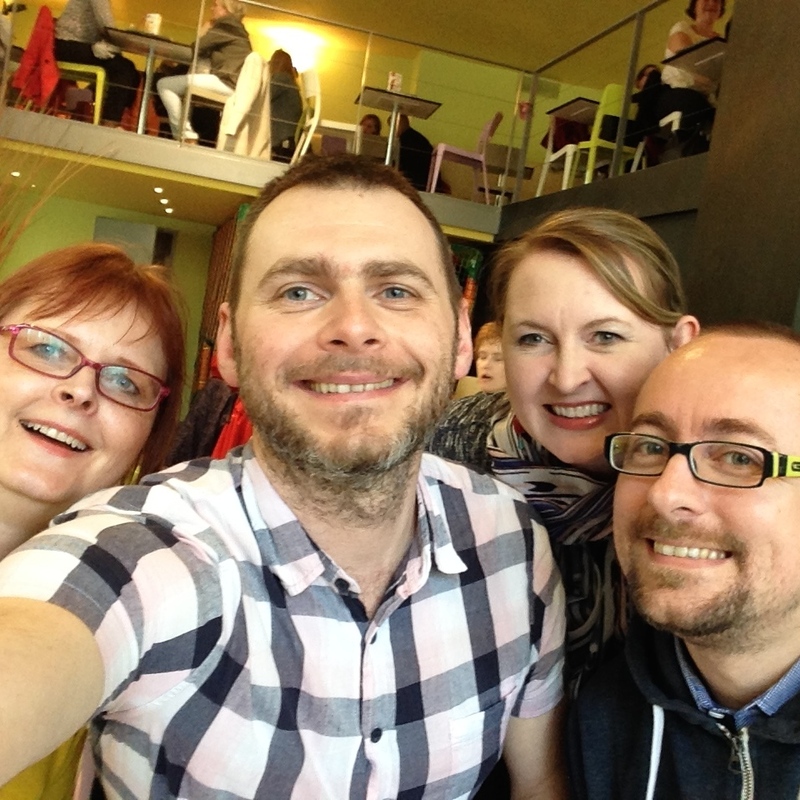 We spent our time in Brno split between sightseeing and hanging out with Mira and his partner Viki. 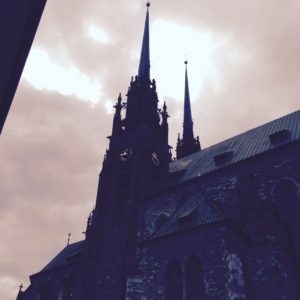 We visited the Cathedral of St Peter and Paul which is a striking 14th century Gothic style Cathedral that sits atop of hill so it’s a great view point of the city. The inside though is much less remarkable compared to other grandiose Cathedrals throughout Europe. So we walked up that hill and then back down and over to Spilberk Park and then further uphill to the castle. The castle is from the 13th century and houses some permanent and temporary exhibits so it’s really more like a museum that touring a castle. We just toured the outside. There are many stunning viewpoints to take photos of the city below looking back towards the Cathedral. Mira and Viki then took us on a city walking tour to parts of the city we wouldn’t have stumbled on, on our own. We visited the outside of the Villa Tugendhat a modernist house listed under the UNESCO heritage sites. We visited a children’s theatre and lazily walked the streets of Brno, all the while my mom taking photos of every possible statue along the way. We then visited The Brno Ossuary which is the second largest ossuary in Europe. 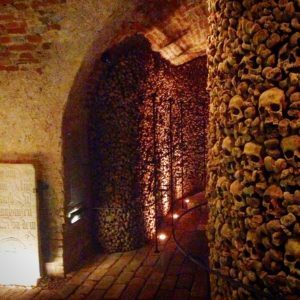 It is believed to contain the skeletal remains of some 50 thousand people from the 17th and 18th century. 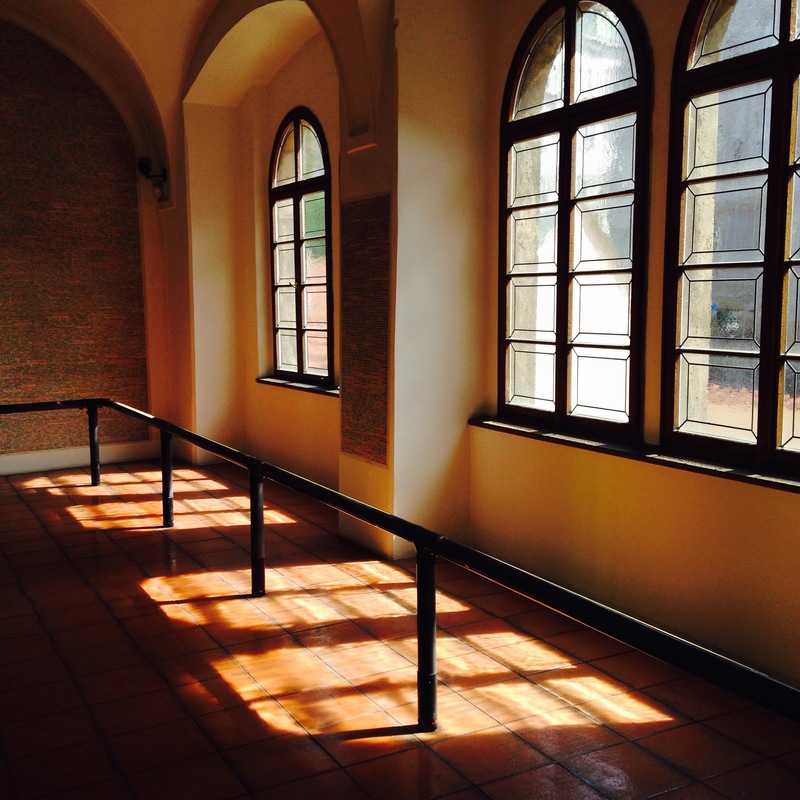 It was rediscovered in 2001 and is now open to the public. As one would imagine it is a somber experience to visit. 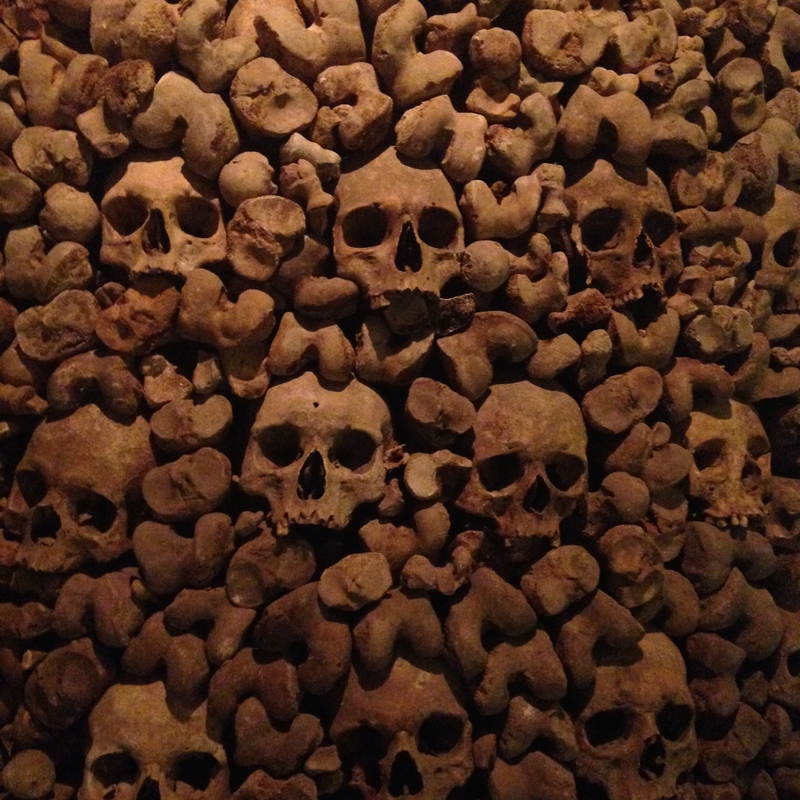 The area is dimly lit with and skulls and other bones arranged in an artistic way. Brno is not necessarily a huge tourist city, and yet you could easily spend a couple days exploring what the city has to offer. It also makes a great transit point if you are heading up to Prague. None of that really mattered to me though, because all I really wanted to do was catch up with my old pen pal Mira. Brno could’ve easily had zero tourist sites and yet, I still wouldn’t have missed out on the opportunity to catch up with this dear soul. One other thing I can tell you about Czech is that the people are wonderful. I’ve actually never experienced hospitality like what Mira showed my mom and I over those 2 days. I sure hope that I will be able to return the favour to him at some point in the future! 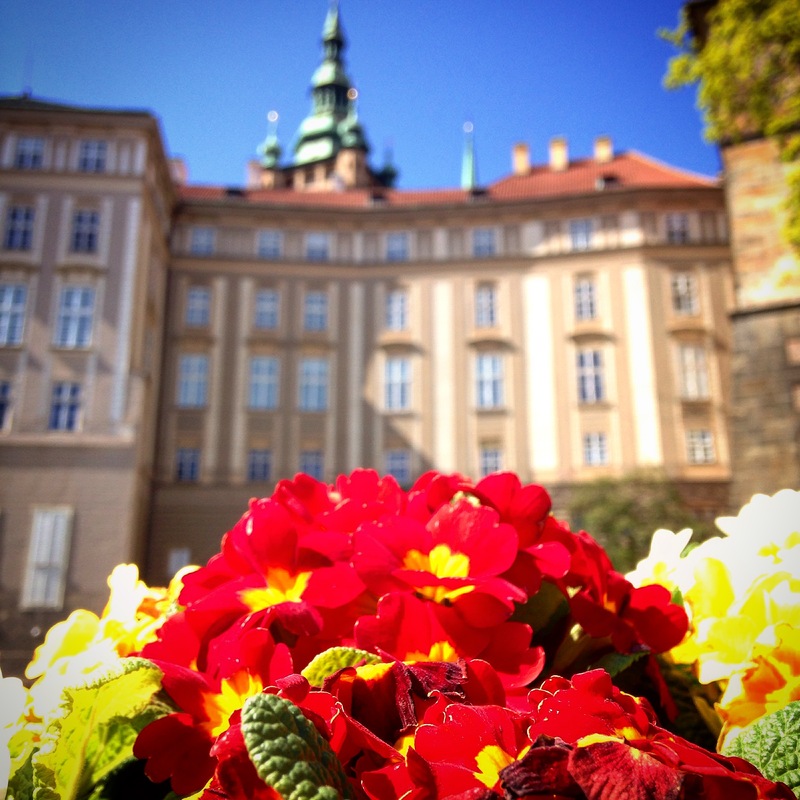 Ceske Budejovice is the largest city in the southern Bohemian region of the Czech Republic. And as I mentioned in my last post, it is where we believe my maternal grandmother was born. This was news to me as I had always grown up believing that she was German. It appears that she was German in ethnicity but likely Czech by birth and then ended up in Germany before emigrating to Canada in 1954. Oddly, things of the past just weren’t discussed in my mother’s family- and so with secrets or forbidden topics comes misinformation. 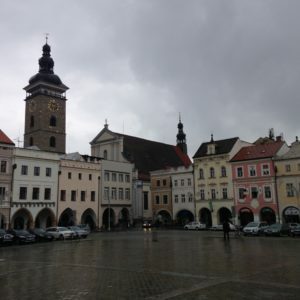 Anyways, the reason Ceske Budejovice ended up on our itinerary was solely for the purpose of my mom visiting the town where her mother was born. We think. She was born in a town that went by the names of Strodenitz or Budweis which is the current day Ceske Budejovice. As far as I can tell there was always a huge number of ethnic Germans living in this region of the Czech Republic, Slovakia and Poland. In fact the Germans and the Czechs/Slovaks lived side by side for hundreds of years. Until the second World War when in 1945 all the Germans were forcibly expelled. 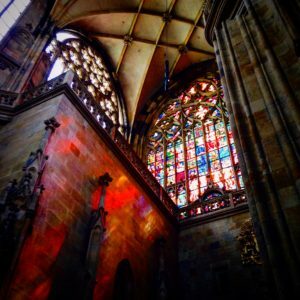 Ethnic Germans as well as Hungarians who had been living in this region peacefully prior to World WarII were stripped of their Czech citizenship and property. As has happened the world over in places like Palestine and in Cyprus- people lost everything and were not able to return to their homes once the conflict ended. It is believed that between 1945-1947 some 3 million ethnic Germans and Hungarians were deported from Czechoslovakia. My Oma (German for Grandmother) and her family were amongst those displaced. My Oma was fortunate that her family was financially stable enough that they did not end up homeless. 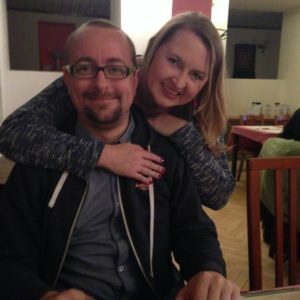 She went on to meet and marry my Opa (German for Grandfather) who I always believed was German but have recently learned that he was actually born in Poland. Again of German ethnicity. After WWII he fled to Germany under similar circumstances as my Oma. My mother was born in Germany in 1954 and shortly after they immigrated to Canada. I so wish I knew this information years ago. I love history and genealogy. I wish I’d asked more questions. I was never especially close to my Oma and Opa. They lived on the other side of Canada and we only saw them when we made the trek out to visit. My childhood memories of them are mostly about us visiting. About how they never ever called me Kristine but rather Kristina with a thick German accent. I remember amazing German baking from my Oma, and how I loved getting her tin of baked goods around Christmastime. And how saddened I was when in her later years she stopped sending these tins out. I remember sitting in the basement watching slide shows of the places they traveled. My Oma and Opa roamed the world. 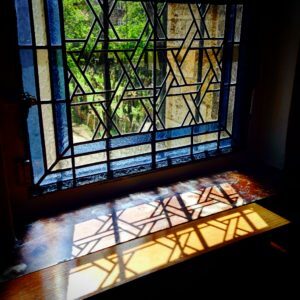 I’m sure my deep rooted love of travel can be traced back to my DNA, directly from my European ancestors who were displaced from their native homes, and boldly continued this sense of travel throughout their lives. I remember loving going to the laundry room at their house. They had souvenirs stickers from the countries they had visited stuck to an heating duct in that room. Memories from the far away lands they had explored. Sadly, I can’t ask my Opa about this new information I have about him growing up in Poland. He passed away late last year, so all the questions I now have will remain unanswered. 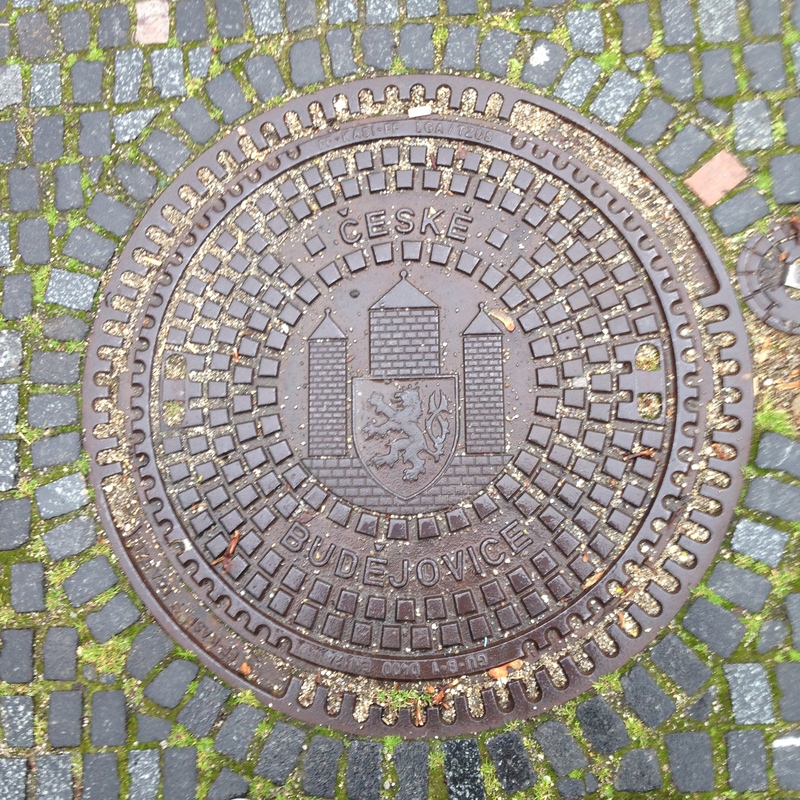 I thought about him a lot while visiting Warsaw last month. 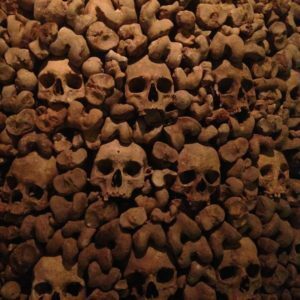 My Oma is still alive, but for her I think the past is in the past so I’m not sure we’ll get any more information than what we’ve already discovered. My mother and I spent one night in Ceske Budejovice. We booked a hotel right in the main square which was lovely to have the views of the square below from our hotel room. Since it was Sunday when we arrived most things were closed. 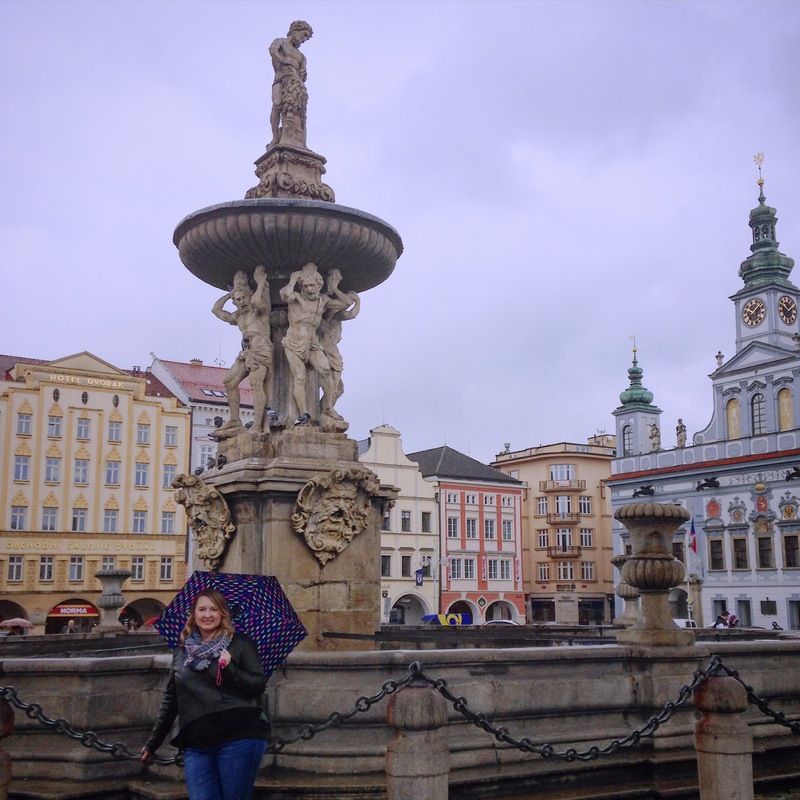 The afternoon was grey with a light drizzle of rain as we explored the main square and strolled down to the river. 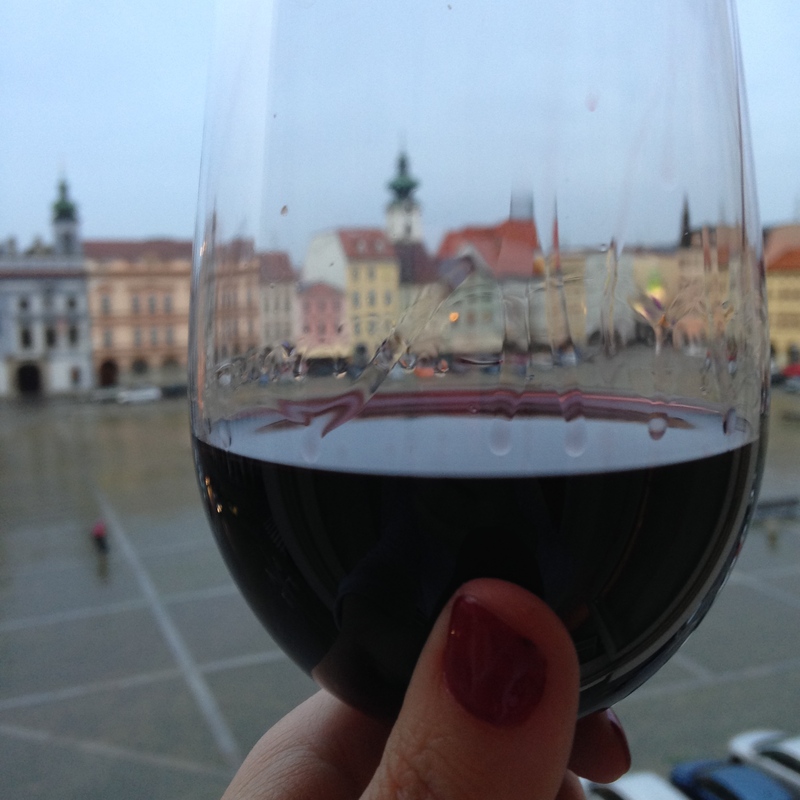 We visited a church, we had some delicious food, and we drank some wine. 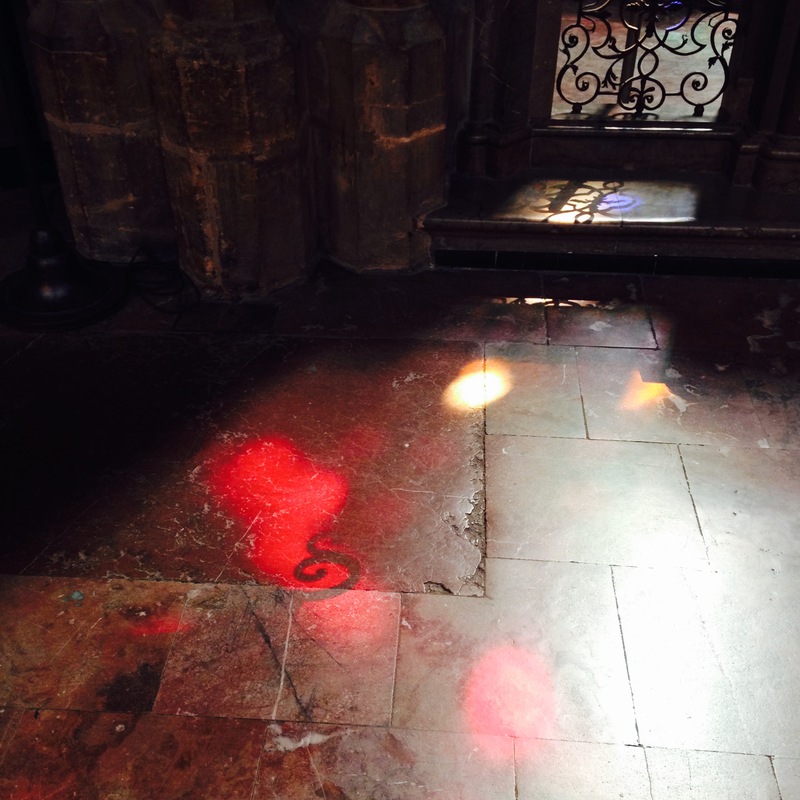 Nothing of any real significance, and yet the time I was there has stuck with me. Mostly the many unanswered questions. The regret of not taking more of an interest in where my mother’s side of the family came from. The disappointment in knowing that many of these question will never get answered. That both my Grandparents were displaced from their native homes as teenagers and I never had the chance to ask them about what that experience was like for them. The sadness of knowing that in the last few months I have visited both of their native countries with no real insight into were they came from. This super cute medieval town was the next stop on my mother-daughter trip way back in April. 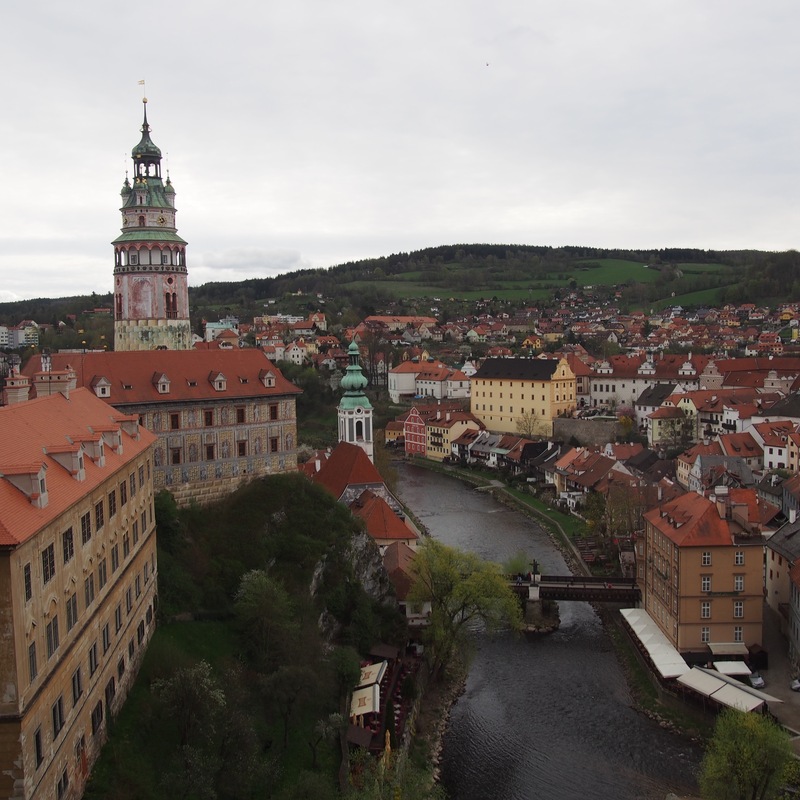 Cesky Krumlov is about a 3hr car ride from Salzburg. It’s not super easy to get to by bus or train so we booked a fairly inexpensive shuttle and had a lovely Czech guy drive us there. This small village is known for being uber romantic and is often referred to as the Fairy Tale village mostly because it looks like it’s straight out of a fairy tale. I actually feel a little jipped that my prince in shining armor didn’t come and sweep me off my feet while we were there. 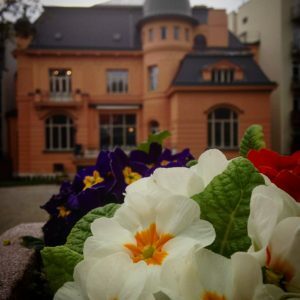 We booked to stay at a hotel called the Ruze Hotel- which is super touristy. Like Asian tour bus kinda touristy. 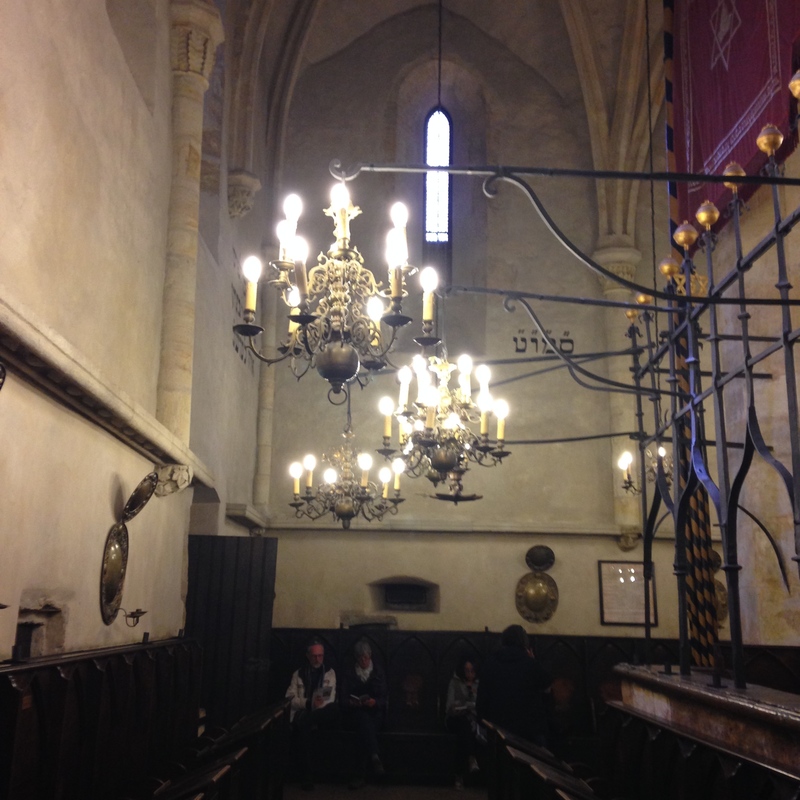 The building is from the 16th century and still carries that medieval theme, hence why the tour buses come. Our room was cute, but honestly I was creeped out for the one night we stayed there. I have way too over active of an imagination, and had I been staying there solo I doubt I would’ve gotten any sleep. There were a couple weird manikins dressed in medieval outfits that I swear were watching us every time we left our room. See. Over active imagination. Although I’m sure a normal person who has a normal imagination wouldn’t have any issues getting a good nights rest. The old part of the town does have a magical feel to it. We checked in and immediately headed out to explore. 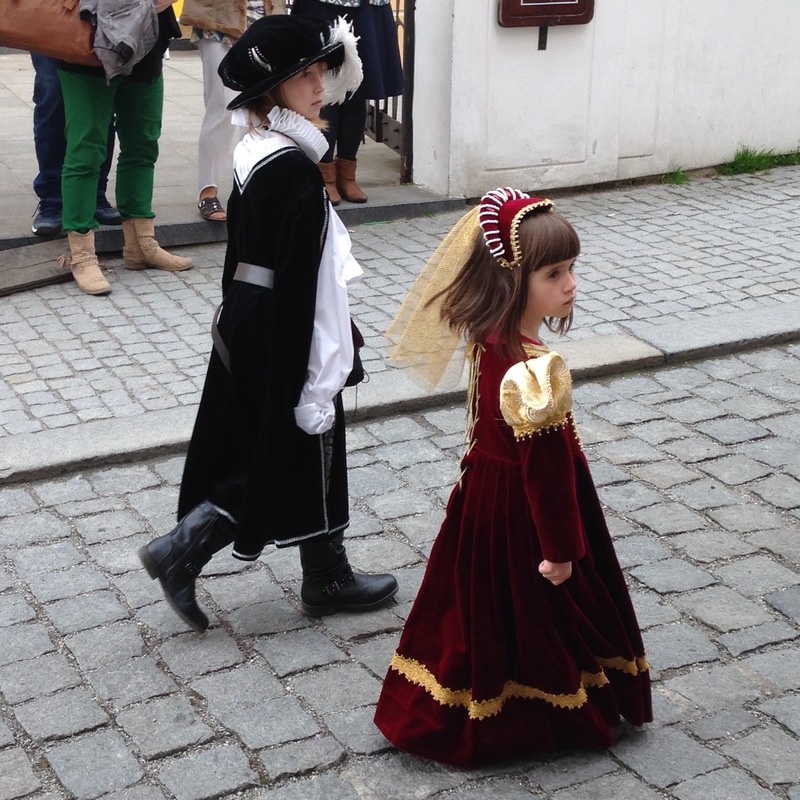 When we stepped onto the main street there was a medieval parade procession coming down the street towards us. 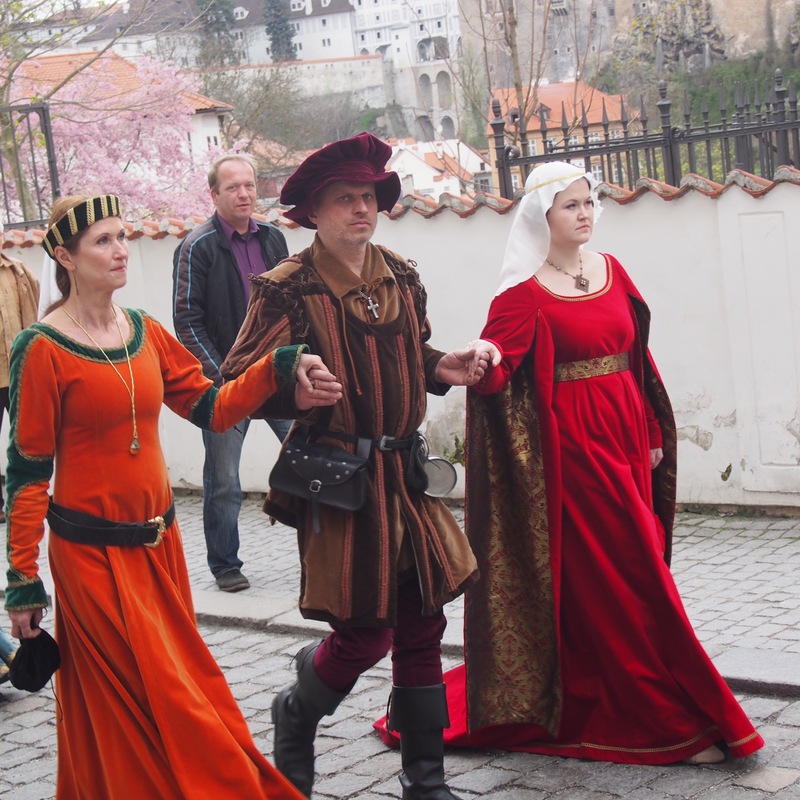 Of course we couldn’t believe that the locals had gone thru all that effort to welcome us and valiantly waved as around 100 medieval costumed people paraded by. Oh wait. It wasn’t actually for us. Duh. It was to mark the first day of the upcoming tourist season. Whatever. My mom and I know secretly know it was to welcome us to the Czech Republic. After our parade passed we set off to explore the town. 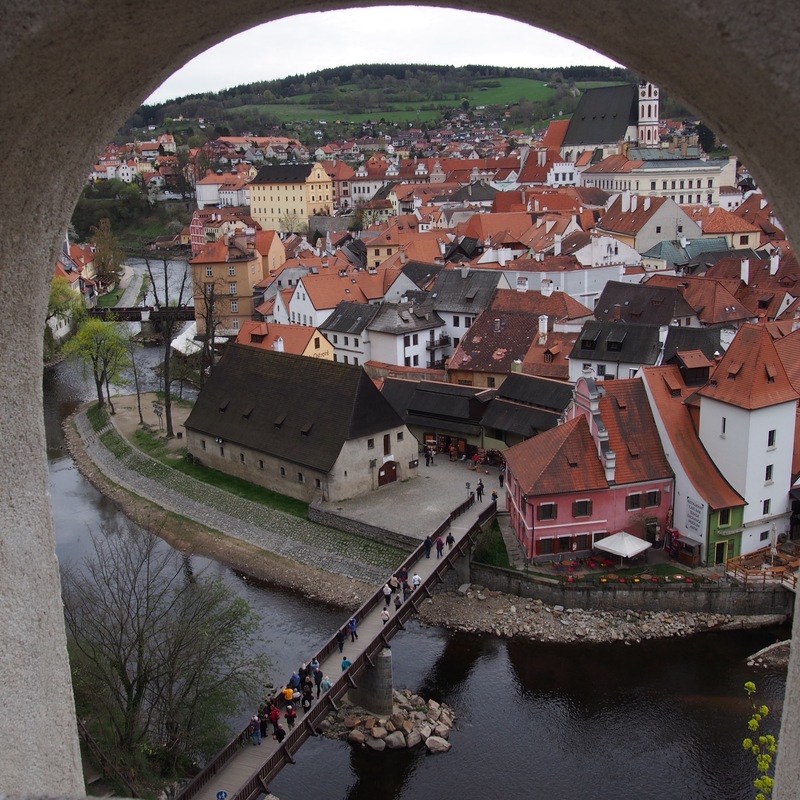 The Vlatava river winds it’s way thru the center of the old town and it really does look like a fairy tale village. The cobble stoned streets and the layered red tiled rooftops with the large and imposing castle and bell tower on the hill on the opposite bank of the river make almost every view point picture perfect. The streets are lined with touristy souvenir shops, restaurants and cafes and multiple amber jewelry stores for which the region is known for. You could easily take hundreds of photos here- just ask my mom as she filled all the storage on her phone in an afternoon. 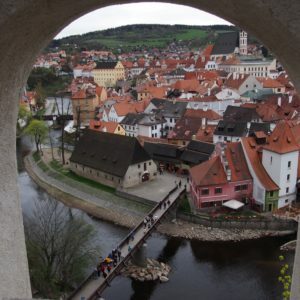 There’s not a ton to do in Cesky Krumlov other than wander the quaint cobblestone streets and visit the castle. The Cesky Krumlov castle dates back to the mid 13th century but has changed hands over the years before being given to the Czechoslovakia state in the mid 1900’s. Today it is a UNESCO heritage site. Visits to the inside parts of the castle are by tour group only, and no photos are allowed. Seriously none, unless you’re very very sneaky. Once you walk through the castle complex you can walk up a rather steep hill into the castle gardens. It was still early in the season so not everything was in bloom, but I can imagine it is colourful and gorgeous in the summer months. Some other travelerss told us about there being a bear in the moat of the castle and truthfully I thought they were trying to pull our leg. Turns out it’s true. 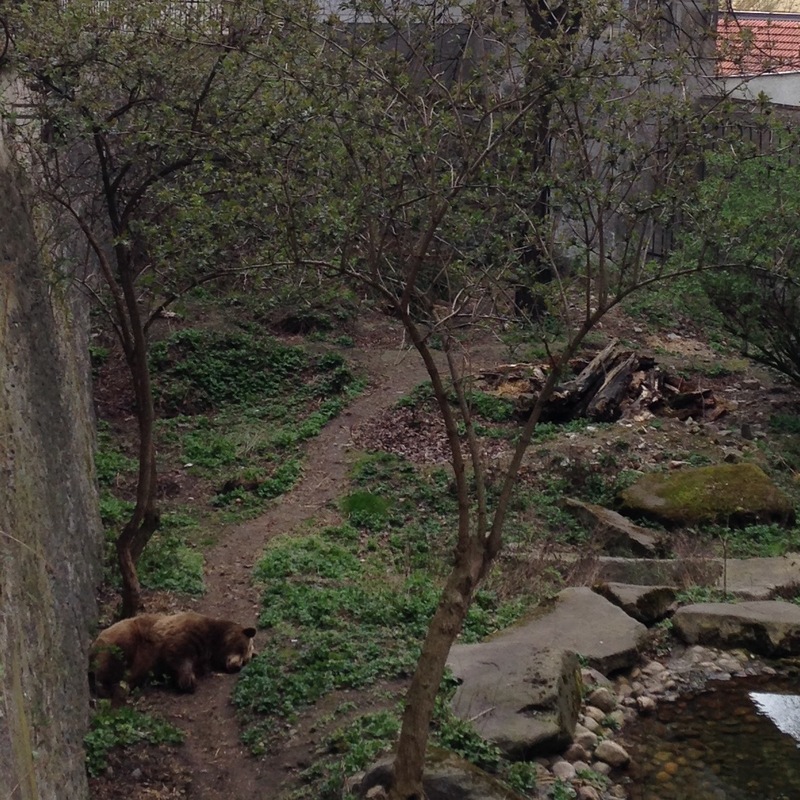 There is a brown bear in the moat of the castle as I saw him getting fed the morning that we left. Apparently bears have been kept in the moat since the earlier 1700s. Who knew? !